Another mixed day – some real lows, but I’m finishing it feeling positive and ready to get out there again before sunrise. I spent a large part of the day with my broken oar – annoying, as I’d originally thought it wouldn’t take that long. I don’t so much mind the time being spent on it, and actually quite enjoy the repair work, but I just find it stressful to watch the miles ticking away in the wrong direction whilst I do it. My first repair of the day (using the shaft of one of the broken oars to splint it) was nice and strong, but really heavy, so I decided to cut the wooden handled end off the splint, thus making it slightly shorter and lighter. This would have been a good idea if my hacksaw hadn’t turned out to be totally useless. About a quarter of the way through the cut, the bolt that holds the top part of the blade in place suddenly pinged off with no warning, leaving the blade swinging from one end. Unfortunately it jumped straight over the side of the boat and disappeared into the blue before I could grab it, so that was goodbye to a properly functioning hacksaw. I then tried tying the end of the blade in place with bits of wire and thin pieces of string, which worked for short times before wearing through. I managed to break two blades in the process, but got most of the way through the cut before giving up on the hacksaw, donning a pair of gloves, and finishing it off with just a piece of broken blade. The oar is still heavy, but manageable for now, and lovely and strong. Thank goodness for zip ties – I brought a lot, but now I’m wishing I’d brought even more. 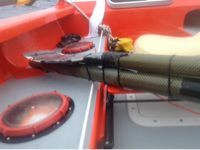 Oar repair – it’s massive and ridiculous! All in all it was quite a ridiculous morning, and I felt like everything was going wrong. I really struggled today with the fact that I’ve already rowed hundreds of miles and have still barely made a dent in the miles toward Hawaii. It’s hard to be constantly waking up further away from where I’m trying to go than I was when I went to sleep, and it’s particularly hard as the further east I get dragged the worse the eastward pull gets. The ‘good’ weather window is now over, and apparently bigger winds and waves and coming back to turn the washing machine conditions on again. Things felt very bleak earlier today and I struggled to see how I’m going to manage to make this westward turn. As I lie I my bunk now I’m feeling better, and am just focusing on continuing south for another couple of degrees (obviously minimising the eastward movement and maximising the westward), where things do look more hopeful. I got some good rowing in throughout the afternoon and evening, and actually enjoyed it as the wind started whipping up the waves later on in the day. They aren’t big yet, but have become confused and choppy, appearing from all sorts of unexpected angles, which felt strangely exciting. As night fell, the horizon all round me shrank inwards, and it felt like Darien and I were dancing through an ever-mutating seascape of bubbling witches cauldrons. You have made a terrific repair to your oar Elsa, it does look cumbersome and heavy but hey you did it and hats off to you. Must have been demoralizing to be dragged backwards whilst you made the repair though! Keep going Elsa we are all egging you on with every oar stroke. Not sure if by me sending comments most days it is getting too much? I am sure I will be informed otherwise if this is the case. Just want to spur you on as you are doing an amazing challenge. Wow! I am in ‘oar’ of your repairs and techniques. It looks good and strong….just hope you can make some headway with it, and your own strength will be equal t the weight. Loving your descriptions of the seas and light – quite poetic which is amazing considering your situation. We visited Jo’s parents today in pretty Tipperary – her dad is v weak at the moment but we were allowed in to see him for 3 minutes which was lovely, and her mum is tired and worried but made us a fish lunch. This evening back in Dublin we had an oriental supper in Dun Laoghaire and then walked the mile or so out round the harbour watching the spectacular sunset and the twinkling lights of a funfair, while a bat wheeled and flung itself around in the still air over our heads. Flying back to Lobdon/Kent tmro. That said I do hope things get easier for at least a while – you totally deserve a good stretch but hey, however it goes you got free caviar right?! You have no idea how you have captured our hearts and thoughts. We saw the teams leave from Monterey with no idea what was going on. Now my entire family sits around the dinner table each night reading the updates and your blogs. Thank you for bringing us along on your incredible journey. My mother and father are visiting us here in San Jose, CA from Kona Hawaii (that’s the big island at the south end of the Hawaiian chain) and will be returning home in a few weeks. Maybe you will hear them cheering you on when you get there? Row with the knowledge that this family thinks you are an amazingly strong young woman who is one of our most inspirational heroes in this house! We are sending you all the positive energy to move west. I wish our breath could become your wind that you need. Fantastic stuff. Really impressed by your ingenuity at fixing the oar and remaining focused and positive when everything seems to be going wrong. Keep it up! I’m sure you hit some strong easterlies soon! Keep finding the sunshine moments and giggly bits amongst the tricky stuff. Nothing will last forever – even the cheeky currents and storms. Go well my friends. Sending you thoughts of useful winds and and happy currents from up here.